Reflecting the various currents of contemporary architecture and urbanism, the Architectural League of New York has announced its line-up for the 2013 Emerging Voices lecture series. The series showcases notable talent from across North America and is selected through a portfolio competition that emphasizes built work. The program has had a remarkable track record at identifying important architects. Past Emerging Voices have included Steven Holl, Morphosis, Jeanne Gang, and SHoP among many other boldface archinames. cao | perrot Studio of Los Angeles and Paris, principals Andy Cao and Xavier Perrot garciastudio of San Diego and Tijuana, Mexico, principal Jorge Garcia (pictured at the top of the post). DIGSAU of Philadelphia, principals Jules Dingle, Jeff Goldstein, Mark Sanderson, and Jamie Unkefer dlandstudio of New York, principal Susannah Drake MASS Design Group of Boston and Kigali, Rwanda, principals Sierra Bainbridge, Michael Murphy, Alan Ricks, and David Saladnick Ogrydziak Prillinger Architects of San Francisco, principals Luke Ogrydziak and Zoe Prillinger PRODUCTURA of Mexico City, principals Carolos Bedoya, Wonne Ickx, Victor Jaime, and Abel Perles SO-IL of New York City, principals Florian Idenburg and Jing Liu All lectures will be held at Scholastic Auditorium located at 557 Broadway. On March 7 the League will feature SO-IL and garciastudio. March 14 dlandstudio and MASS Design Group will lecture. DIGSAU and Ogrydziak Prillinger will speak on March 18 and March 28 will feature cao | perrot and PRODUCTURA. Architectural League Prize for Young Architects + Designers 2012: No Precedent Arnold and Sheila Aronson Galleries Parsons The New School for Design 66 Fifth Avenue June 21–August 3 2012 marks the 25th anniversary of the Architectural League Prize for Young Designers and Architects. Each year, up and coming talent, defined as less than ten years out of school, is recognized for excellent and inspiring work. This year's theme was No Precedent, and reflects the committee’s perception of young architects’ careers as “suggestive, speculative, and on the brink,” according to a statement. 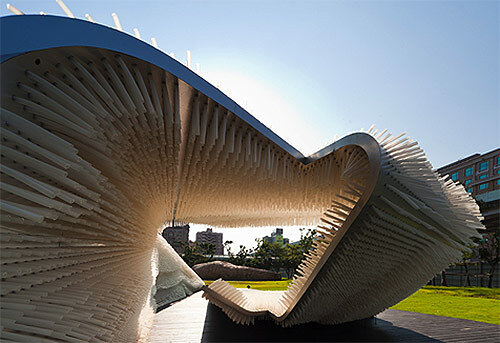 The exhibition includes Jorge Arvizu, Ignacio del Rio, Emmanuel Ramirez, and Diego Ricalde, MMX Studio, Mexico City; Jimenez Lai, Bureau Spectacular, Chicago; Sean Lally, WEATHERS/Sean Lally (above), Chicago; Seung Teak Lee and Mi Jung Lim, STPMJ, Brooklyn; Michael Szivos, SOFTlab, New York; Koji Tsutsui, Koji Tsutsui & Associates, San Francisco and Tokyo. The word "folly" is derived from the French folie, or "foolishness." Also known as an "eyecatcher," a folly was traditionally an extravagant, non-functional building, which was meant to enhance the landscape. Rooted in Romantic ideals of the picturesque, a folly often acted as an ornate small-scale intervention which transformed and visually dramatized the landscape around it. 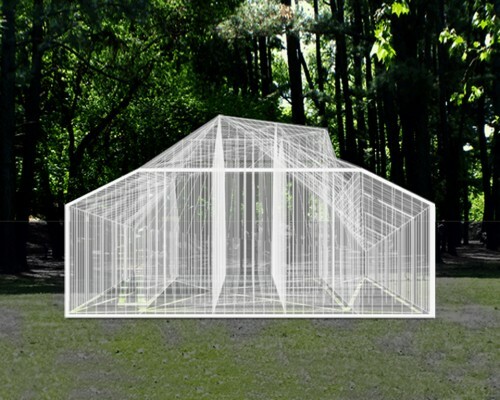 The winners of this year's Folly Competition sponsored by The Architectural League of New York and Socrates Sculpture Park, competition winners Jerome Haferd and K. Brandt Knapp proposed a new interpretation of the folly, "Curtain." Rather than being a whimsical, ornate structure which sits in the landscape, this folly, built from white plastic chain, is more like a small pavilion. 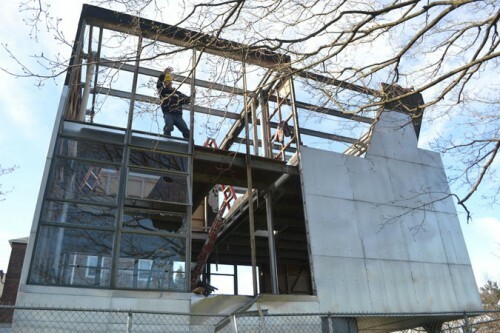 The restraint shown by this structure echoes the idea of Shigeru Ban's "curtain" wall house, something which represents a new vision for a folly. Shown in the landscape as an object, the building is closer to Corbusier's Villa Savoye than to The Dunmore Pineapple or the follies of Parc de La Vilette. 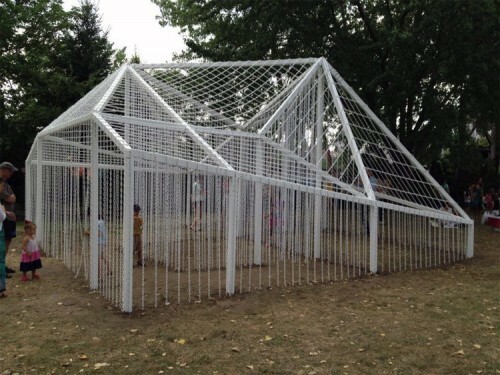 There is no formal exuberance, no faux-ruins, no absurdity, only a white pavilion-like structure. 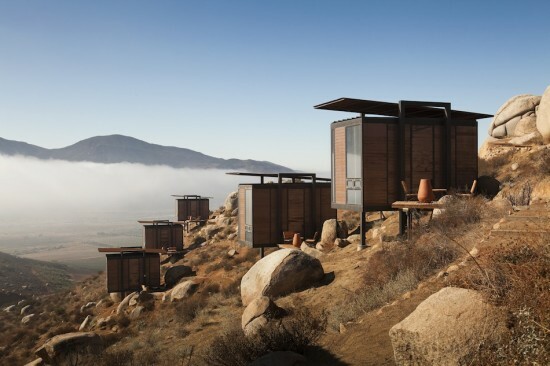 In an idiosyncratic interpretation of "folly", the architects have chosen spatial effects as the jumping off point for an object in a landscape. This project is by definition a folly, especially the version that has been used in the United States, which often includes garden pavilions and gazebos. This project alters our perception of the landscape via translucency. 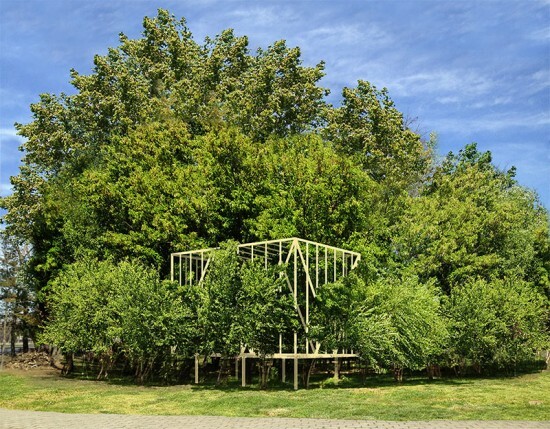 It mediates between visually obscuring background trees, operating in the middle ground as a spatial intervention, while simultaneously existing as a voluminous foreground object. It is a non functional building aligned with sculpture, or architectural installation. The white box with the faceted roof also reflects what is apparently the personal fancy of the architects, and thus "Curtain" cannot escape the definition of folly, while also "redefining" the term. 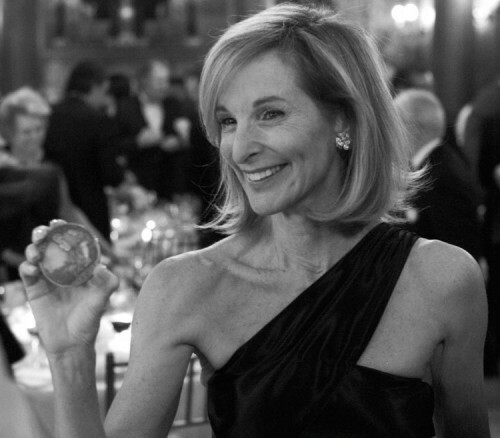 Amanda Burden, Chair of the New York City Planning Commission and Director of the Department of City Planning, is the recipient of the Architectural League of New York’s highest honor, the President’s Medal. The League’s President and Board of Directors grant the award to individuals in recognition of an exceptional body of work in architecture, urbanism, or design. The medal was presented to Burden last night at an awards ceremony. According to the League, Amanda Burden has “raised the bar for quality design in public and private development, demonstrating that good design is essential to the long-term health and sustainability of cities.” Under Burden’s leadership, the City Planning Commission has worked to promote transit-oriented economic development through rezoning more than a third of the city, with the creation of urban master plans for major neighborhoods like Jamaica, Downtown Brooklyn, Hudson Yards, Coney Island, and 125th Street. 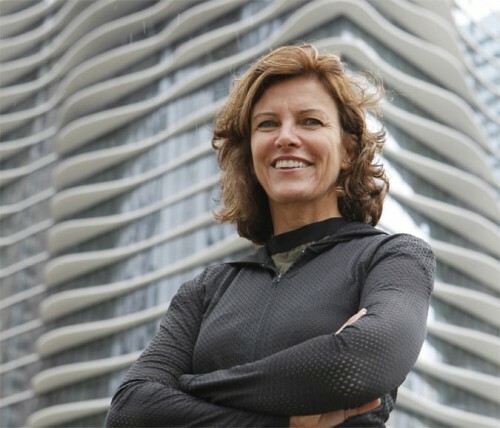 Burden has been instrumental in the development of some of New York City’s most important public spaces, including the High Line, the revitalization of Lincoln Center for the Performing Arts, the East River Waterfront Esplanade, IKEA Erie Basin Park, and the National 9/11 Memorial. Through these efforts, Burden has been a champion of design, proving its role in fostering economic and social development of communities. Eight up-and-coming architecture firms from across North America have been distinguished as Emerging Voices by the Architectural League. The prestigious award is bestowed annually on a group of firms that have established a distinct design voice in their work and have "the potential to influence the disciplines of architecture, landscape design, and urbanism." This year's winners are INABA, 5468796 architecture, SCAPE Landscape Architecture, Studio NMinusOne, Oyler Wu Collaborative, SsD, Arquitectura 911sc, and Atelier TAG. A jury comprised of Henry Cobb, Geoff Manaugh, Paul Lewis, Jamie Maslyn Larson, Annabelle Selldorf, Claire Weisz, and Dan Wood selected the firms based on a review of their portfolios. Past Emerging Voices have included many of today's top-name architects including Morphosis, Enrique Norten, Deborah Berke, Michael Maltzan, SHoP Architects, Jeanne Gang, and Steven Holl. 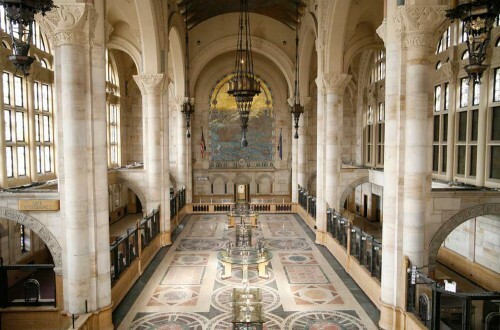 Each year, the winning firms present their work at a lecture series presented by the League in New York. Beginning on March 2, will take place at the Rose Auditorium in the new Morphosis-designed building at The Cooper Union. Also watch for an upcoming issue of The Architect's Newspaper where we feature a profile of each Emerging Voices winner. Information on the lecture series and architecture firms from the Architectural League: All lectures will be held at the Rose Auditorium, The Cooper Union, 41 Cooper Square, New York City at 7:00 p.m. Tickets are required for admission to the lectures. For more information on the lectures and tickets, visit www.archleague.org, beginning February 1. Friday, March 2 INABA, Jeffrey Inaba, New York and Los Angeles: INABA’s projects range from books and diagrams to installations, creating physical form from abstract content. 5468796 architecture, Johanna Hurme and Sasa Radulovic, Winnipeg: With a focus on housing and public projects, the collaborative office playfully explores the possibilities of architecture within the constraints of modest budgets and materials. 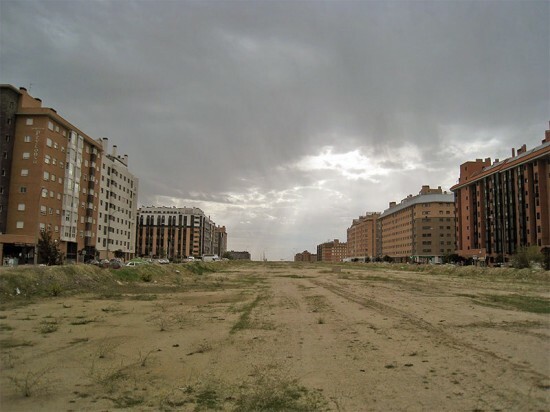 Friday, March 9 SCAPE / Landscape Architecture, Kate Orff and Elena Brescia, New York: Through its landscape and urban design practice SCAPE researches new futures for the urban-natural environment. Studio NMinusOne, Christos Marcopoulos and Carol Moukheiber, Toronto: The studio’s work, both built and theoretical, explores the frontier of the digital and real and its effects on the physiologies of occupants of buildings and environments. 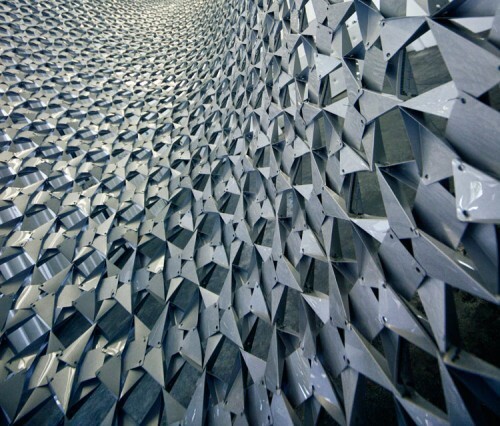 Friday, March 23 Oyler Wu Collaborative, Dwayne Oyler and Jenny Wu, Los Angeles: Oyler Wu’s installations, pavilions, and façade experimentations are informed by and explore fabrication processes and materials. SsD, Jinhee Park and John Hong, New York, Boston, and Seoul: The firm’s work, from private residences to light sculptures to public buildings, combines research and production to find multivalent expressions from minimal form. Friday, March 30 arquitectura911sc, Jose Castillo and Saidee Springall, Mexico City: The office responds to the rich social and political complexities of Mexico in its wide-ranging work from social housing to urban planning. Atelier TAG, Manon Asselin and Katsuhiro Yamazaki, Montreal: The firm builds primarily in the public realm exploring the civic functions of architecture.